(Toronto, ON) – How would you make things better with $10,000? Noel Reid will be planning how to do just that as the winner of the 2008 make things better contest, presented by Toyota Canada and RBC Rewards. 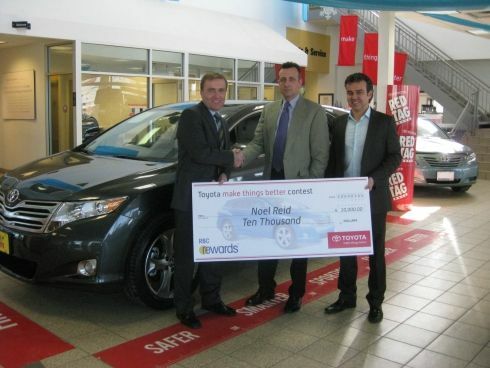 Mr. Reid, a Toyota Highlander owner, collected his $10,000 cheque today at Woodbridge Toyota. Whether you need a vehicle as a working tool or an efficient eco-friendly commuter, Toyota is demonstrating in green shows, farm shows and other local events across Canada how Toyota vehicles fit into the lives of Canadian drivers. The 2009 make things better contest started February 15th and runs until December 15th. Ballots may be filled out at home shows in Vancouver, Edmonton, Toronto and Montreal, the Ottawa Go Green Show and the Canadian Outdoor Farm Show. Canadians may also enter at www.contest.toyota.ca. “make things better” remains a call to action for Toyota Canada, Toyota dealers and Canadians in general, to reach out within the communities where they live and work. Toyota dealers in particular are working very hard to make things better in their communities. As an example, Woodbridge Toyota, the dealership where Mr. Reid picked-up his cheque today is an active partner in the Toyota Evergreen Learning Grounds program, contributing $4,000 to the local community to transform barren asphalt and turf into rich, natural learning environments. More information about Toyota is available at http://www.toyota.ca/. More information on RBC Rewards can be found at http://www.rbcrewards.com/.